The increased aesthetic appeal of columns with flares resulted in bridge configurations with flared columns during the 1970–1990 design periods in California. Earthquake reconnaissance reports indicated that the flare is detrimental on the structural functionality of the bridge with some geometric configurations. This research examines the relative vulnerability of bridge configurations with flared and non-flared columns for three-span two-column bent bridges with oblong cross-sections. The numerical model of the columns with and without flare is calibrated with existing experimental results. The calibrated models are used to develop the fragility curves for California bridges. 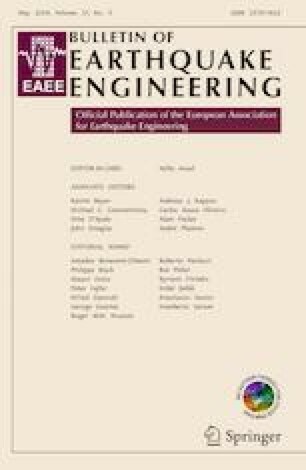 Fragility curves for each bridge class are generated by accounting for the material, geometric, and structural uncertainties, and the effects of column flare on the seismic demand and fragility of bridges are investigated in detail in this paper. Results reveal that the presence of column flare for the case study bridges increases the stiffness and strength of columns because of a low potential of column shear failure, resulting in the reduction of bridge vulnerability and have beneficial effects on the structural functionality. Thus, the flare does not necessarily reduce the seismic performance for all bridge cases and depends on the failure mode associated with the bridge configuration. The fragility curves suggested in this research can be used by stakeholders in deciding the retrofitting and maintenance strategies of bridges with architectural flares. The research was supported by a Grant (18CTAP-C130227-02) from Technology Advancement Research Program (TARP) funded by Ministry of Land, Infrastructure and Transport of Korean government. This work is also financially supported by Ministry of Public Administration and Security as Disaster Prevention Safety Human Resource Development Project.